I was born in Sidcup, which is a small town on the borders of South London and Kent. My cultural background is diverse, and I am actually in the process of working on my family tree, which I am hoping will give me a clearer picture of my cultural background. London is a culturally diverse place to live, so strangers often ask me about my ethnicity. After attending a mixed primary school, I moved on to an all girls secondary school which I did not particularly enjoy as I missed having male peers. I believe this played a major role in why I felt the need to work in male-dominated environments in my early career. I had a strong interest in design from an early age, and have always wanted to pursue a creative career. However, despite gaining qualifications in highly creative subjects, my first job was working for a Bank. At the time, this seemed to be a stable career path. I appreciated the security of a regular income, yet the environment was not one that I could ever see myself being in long-term. I then went on to secure a position working for a large construction firm, my boss at the time was a former Architect turned Project Manager who encouraged me to go on site as much as possible. We soon entered into conversations about which design we liked, what we didn’t like, and if we were in charge of the design how we would do things differently. It was then I realized that the creative path I wanted to pursue was interior design. I loved the idea of working on something, which had such a visual end result. With his encouragement, I soon enrolled in a course at a leading Interior Design school. It has taken me a while to realize that my design influence comes from people and of course other designers. I keep myself well informed on current trends by looking online and reading magazines, but inspiration and influence always come from physically being in an environment. Like most designers, I particularly like traveling and am always inspired by how uninhibited other cultures are when it comes to decorating their homes. 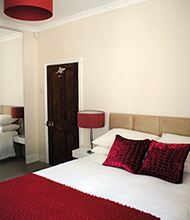 My clients have varied in age from younger to older couples, busy single London professionals, to large families. As a designer, it is always important to take a detailed brief at the beginning of any project and to take into consideration how people live. For example, whilst designing a space for a family with three young boys, it was important to consider the practicalities of everyday living. You do not want to suggest fabrics and fittings to clients that look fabulous initially, yet are worn and tired looking after 6 months. Conversely, while working on projects for young professionals who live alone with no pets, you have the luxury of working with more delicate fabrics and fixtures. Whoever I am working for, it is always important that I put my own personal taste to one side; you are always working to the clients’ brief and lifestyle. A project should always be designed for the individuals and be a reflection of their personality rather than yours. After graduating, I quickly realized that it was domestic interiors that I wanted to work on rather than commercial, this was apparent in my final project work. With domestic interiors, you are always working on a client brief and budget yet there is an opportunity to often be more creative, you are not restricted to commercial furniture. Having also been approached to complete freelance projects whilst studying, I also realized that I immediately wanted to start my own company. The challenges I have found is that when starting any business you need to be patient, as there are periods when you are very busy and some when you are not; therefore it is important to diversify as much as possible. In terms of sacrifices, this would have to be my own personal time. I often work long hours and weekends when I am working on multiple projects. The lessons you learn when you are selling a creative service to a client is they quite rightly have high expectations of the end result. They are paying you a generous hourly rate or design fee, therefore, you need to deliver. As a trained designer you need to produce something that they could not have created themselves from high street shopping. I have found that people still want to decorate their homes yet sometimes this can be in a different way. What I noticed last year is that I was commissioned to work on house extensions more, with the housing market still unstable in London, some people are choosing to stay in their current property and extend rather than spend money on decorating a property that may sadly have a market worth that is less than it was 3-5 years ago. 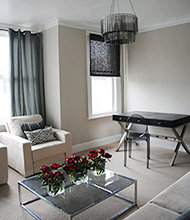 The benefits of being a professionally trained Interior Designer means that I have an in-depth knowledge of all areas of interior design and enjoy working on varied projects. 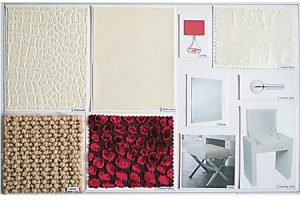 I would however say that my speciality, and an area in which I get repeat business from, is colour consultations. Clients often have existing furniture and fittings that they have accumulated over the years, which they are keen to keep, hold of, I enjoy suggesting a color scheme to them, which will complement their existing furniture and fittings. 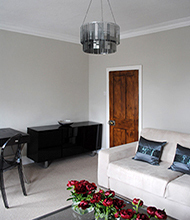 The brief for this room was to create a neutral light space; the room has interesting existing features such as the original Edwardian fireplace, cornice, and original skirting boards. The initial stage was to strip the room back completely. This involved removing the existing lincrusta wallpaper and took quite a while as it had several layers of paint added to it over the years. 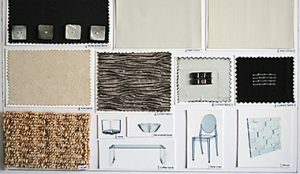 The next stage was to plan the floor space, to create a floor plan showing the furniture layout, and then to move on to selecting the furniture and fittings, wall coverings and accessories. 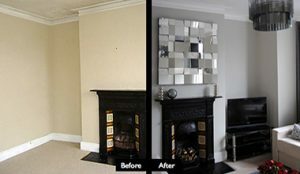 The first stage was to remove the existing woodchip wallpaper, which was covering the chimney breast and external wall. Luckily the plaster was in relatively good condition underneath, so the wall could simply be ‘made good’ so that lining paper could be hung. Life is always a balance when your work plays a major role in your daily routine. When you are working on any design project, you are working to deadlines and of course your own high standards. I find I always have time to socialize with friends, as there is always a window in the evening to catch up for a couple of hours for dinner. However, it is difficult when you are unable to spend a Sunday afternoon with someone because you have a yearning to work on developing your own business. It is certainly something that I need to address as life is indeed about balance and your career is not able to offer you emotional support in your life. The primary similarities in design are that designers are all striving to create a beautiful product or interior, which our clients will want to purchase or live in. I would say if you asked any designer what they are striving to achieve; they would agree that it is that ‘wow factor’. The voids within the design are that many people have different working practices, and unfortunately, some individuals do not have a full understanding of the role of an Interior Designer. For example, it is important that designers are fully equipped with up to date floor plans and any other technical information required for them to complete the design of the property. The role of a professional Interior Designer, rather than a decorator, is to have extensive knowledge of ergonomics, general building construction and health and safety requirements. Their role is not limited to surface decoration so they need to work closely alongside the other disciplines working on the project, including the Architect and tradespeople to ensure they have an in-depth picture of the buildings requirements. I am certainly able to mentor, but at present, I have yet to explore this further. I would be particularly interested in mentoring someone from a different country. London is such a hub for interior design so it would be great to connect with someone who does not have access to the many resources that are available to someone who lives in such a big City. 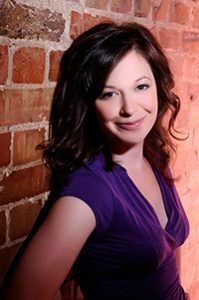 In this industry it can be a struggle for women to be transparent however, I have always felt the need to be known and respected for my work rather than being a lone female in what can sometimes be a very boisterous, male-dominated environment. When I was younger, I was very aware of what my male colleagues used to say about women in the industry, partly because I used to hear them or they would feel the need to tell me at social events. I was never really offended by such comments, as they gave me the drive to work much harder in whatever position I had to ensure that I was taken seriously. In doing so, I found that once you have gained the respect of male colleagues they are very loyal and respectful to you and will encourage you professionally in every way. Organizational affiliations can be very crucial, as it helps to be involved. I am still very much affiliated with KLC School of design where I studied Interior Design. I attend as many Continual Professional Development (CPD) courses that I can. As with any industry, it is incredibly important to keep up to date with new technologies and trends, attending events that are often presented by industry leaders really help in keeping your skills and knowledge up to date. As a designer, it is always important to keep well informed of current trends, including those on color. I will always make clients aware of current trends and how they can be incorporated into a design, however, it is always important to remember that ‘trends’ are changeable and therefore it is always wise to incorporate the seasons’ latest looks in a minimal way. For example, the 2013 Pantone color of the year is Emerald green. Unless it is a color, which is a personal favorite, it is always wise to incorporate bold colors such as this in small items of furniture that can be easily changed such as cushions rather than large pieces. In 2012, I was selected as a panel expert for The Great British Home Show and found it to most enjoyable. Since then, I have done other talks but, the interesting thing about this show is that it was for the average homeowner who was looking for general design ideas. With this in mind, I made sure that the talk was pitched at this demographic, making it accessible to all by giving people ideas that they could easily implement in their own homes. I gave the audience a ‘through the keyhole tour’ of each room and gave advice on how color can be used throughout the home to improve our mood and wellbeing. In order to keep people engaged throughout the presentation, I used visuals of celebrity homes and asked them to guess who lived on the property based on the interior color choices. It is interesting how someone’s personality often plays a major role in how they choose to decorate their property, and by using known individuals rather than showing photographs of my clients work, I was able to demonstrate this. I believe that there is a perception by some people that interior design is for the elite. Therefore, I make myself very approachable when attending events such as this by encouraging lots of questions throughout, and welcoming people over who wish to ask one-on-one questions at the end of a session. My work has primarily taken place in London and I feel very fortunate to be living and working in such a vibrant city. London is a capital of design and a hugely creative place to live. I particularly love design week, which comes alive in September, there are usually almost 300 events being held around the capital, which gives you the opportunity to explore an infinite amount of design ideas. I believe living in such an exciting city has made it easy for me to be continually engaged in London based projects; however, I would absolutely love to do a collaborative project in such an equally exciting city such as New York. I have visited the city once and was just amazed by the scale of everything; it is not until you approach a building district such as the flatiron that you realize why these early New York skyscrapers maintain such an iconic status.